Kurt Vonnegut is one of my favorite authors. I absolutely adore his style, wittiness and straightforwardness in his prose, and like many others, the novel “Slaughterhouse-Five” was my introduction to him. With the novel being held to such high regard for me personally, I was a bit nervous going into this film. However, though slow to begin, the movie was actually quite well done. Directed by George Roy Hill, this film sat nicely between Butch Cassidy and the Sundance Kid and his phenomenally huge success with The Sting the following year. 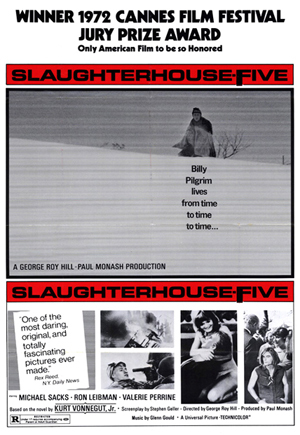 Michael Sacks stars as the protagonist, Billy Pilgrim, who becomes, famously, unstuck in time. Like the novel, the narrative of Billy’s life jumps back and forth through his timeline with heavy emphasis on his time in Germany during World War II. Vonnegut, himself a POW during World War II in Dresden when it was bombed, tells his autobiographical tale of the feelings he encountered and the time there vicariously through the fictitious Pilgrim. Through Pilgrim’s turmoil during the war, his average subsequent life and, ultimately bizarre encounters in the world of Tralfamadore, we see the portrait of a man who was forever changed by the moments he experienced during the brief part of his life he lived as a soldier. Sacks, who went on to be a top executive in the financial sector with such companies as Morgan Stanley after leaving his acting career in the mid 1980s, does a reputable job in the lead role. His nuances playing the older Pilgrim were quite well timed in contrast to the young Pilgrim, this being especially impressive considering that Sacks was only 24-years-old at the time of filming. George Roy Hill as a director has never wooed me to any speakable degree, but he is a solid director, and for that I laud his talents more than someone who tries to thrill you with each and every shot like Terrence Malick. A director’s job is to select the shots and direct the actors to performances that best suit the story; Roy Hill seems to pass this test with flying colors in each and every one of the films of his I have seen. Some of the best magic is that which tricks, but doesn’t overwhelm the eye. The cinematography by Miroslav Ondricek was very pleasant. Tinged with the grittiness of early 1970s experiments in faster film stock, the naturalness and softness of the light were provocative of this era, one of my favorites in the evolution of the motion picture. If you loved the book, you will like the movie. As far as adaptations go, it’s probably one of the better ones. If you’ve never read the book and plan on never doing so, then well, shame on you, but you’ll probably like the movie too.